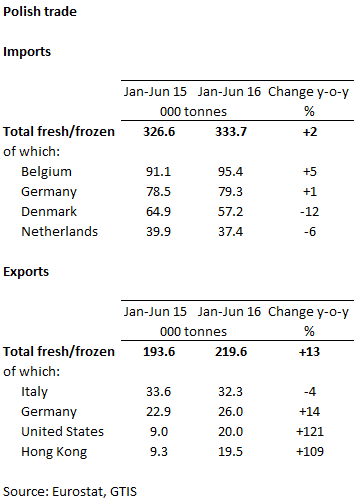 POLAND - Polish exports of fresh/frozen pork increased in the first half of 2016 on a year earlier, up 13 per cent to 219.6 thousand tonnes. Italy remained the largest recipient of Polish pork, although volumes were back 4 per cent, and it accounted for just under 15 per cent of all Polish exports. As per the first quarter of 2016, shipments to Germany, the United States and Hong Kong continued to rise, with exports to the United States and Hong Kong more than doubling on last year’s levels. This increase in shipments has been supported by a rise in the number of imported live pigs into Poland, which are up 10 per cent in the half year to June on 2015 levels. This has helped to prop up Polish production, at a time when their breeding herd has declined by 16 per cent. Imports of fresh/frozen pork in the first half of 2016 recorded a slight increase on the year earlier, by 2 per cent to 333.7 thousand tonnes. This was predominantly driven by a 5 per cent increase in Belgian shipments, while volumes from Denmark were back 12 per cent on the year earlier. German imports largely stood on last year’s levels.